OCTOBER 2018 • FOODSERVICE EQUIPMENT & SUPPLIES • 59 C entral Campus Dining Hall joins the University of Vermont's (UVM) dining operations. This Burlington, Vt., dining opera- tion was built as part of the new 695-bed Central Campus Residence Hall and the newly renovated Bailey/Howe Library. The university expects the building, which opened in August 2017, to receive LEED Gold certification. The new all-you-care-to-eat din- ing operation, which sits on the ground floor of the residence hall, replaces a main cafeteria that was situated in an old library building that formerly also housed the school's student center. A new dining operation became necessary when UVM administrators decided to turn that building into a library exclusively. Two years ago, a UVM team of administrators, faculty and students rewrote the foodservice contract with clear guidelines to connect campus dining to pedagogy and study how the student population eats on campus. Working with Sodexo, the campus' foodservice provider, UVM established its goals for the Central Campus Dining Hall. The goals include an emphasis on the educational experience for the students that reflects aware- ness of the food system from farming to the waste stream. This state-of-the-art facility not only serves food to the 695 residents of the building, but any student on a meal plan can utilize the dining hall when visiting central campus. 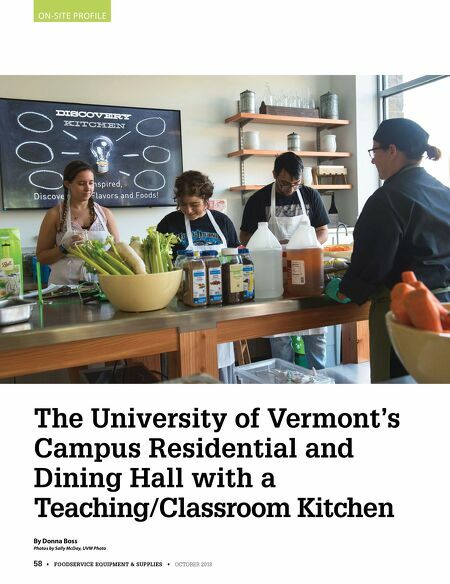 "With an intentional academic focus, the dining hall has a farm-to-table format with a focus on local foods, sustain- ability efforts and lifelong learning experiences related to food systems," says Dennis DePaul, UVM's associate dean for student affairs. "We've set a precedent here at UVM to connect academ- ics and the dining experience," adds Cynthia L. Belliveau, dean of UVM Continuing and Distance Education and research faculty member in Nutrition and Food Science and Medicine. "We want to connect students to what they are eating and how foodservice relates to the academic subjects they are learning about. For example, students work with faculty members teaching their courses to learn about the different aspects of a food system, from how and where the food is grown to how it is procured and prepared — all the way to how it enters the waste stream, by either being composted to sending it to a landfill. Students also monitor the contractual obligations between producers and buyers. We want all the facets of the food system to be transparent to students, parents, faculty and visitors." "As part of the renovation, work space was added for student interns working in sustainability, nutrition and marketing," says Melissa Zelazny, director of UVM Dining. 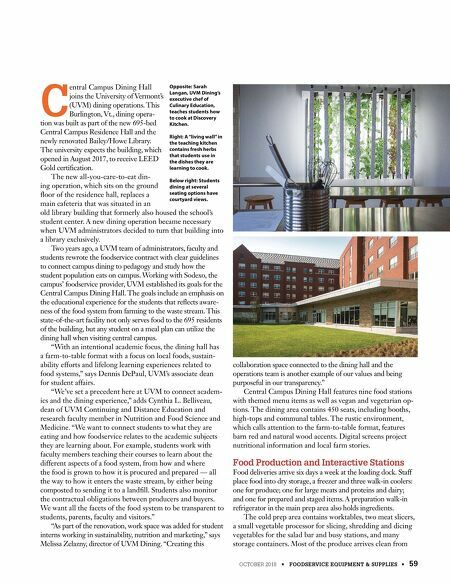 "Creating this collaboration space connected to the dining hall and the operations team is another example of our values and being purposeful in our transparency." Central Campus Dining Hall features nine food stations with themed menu items as well as vegan and vegetarian op- tions. The dining area contains 450 seats, including booths, high-tops and communal tables. The rustic environment, which calls attention to the farm-to-table format, features barn red and natural wood accents. Digital screens project nutritional information and local farm stories. Food Production and Interactive Stations Food deliveries arrive six days a week at the loading dock. Staff place food into dry storage, a freezer and three walk-in coolers: one for produce; one for large meats and proteins and dairy; and one for prepared and staged items. A preparation walk-in refrigerator in the main prep area also holds ingredients. The cold prep area contains worktables, two meat slicers, a small vegetable processor for slicing, shredding and dicing vegetables for the salad bar and busy stations, and many storage containers. Most of the produce arrives clean from Opposite: Sarah Langan, UVM Dining's executive chef of Culinary Education, teaches students how to cook at Discovery Kitchen. Right: A "living wall" in the teaching kitchen contains fresh herbs that students use in the dishes they are learning to cook. Below right: Students dining at several seating options have courtyard views.